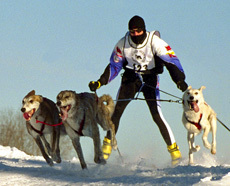 Breeds like Huskies, Malamutes and Samoyeds are obvious choices for this sport, where the owner and dog get their exercise together. However Pointers and Pointer crosses are also good sled dogs (Daisy likes that idea – although at her advanced age she will be a spectator only). 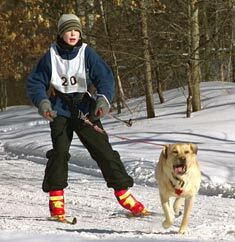 In this sport, the cross-country skier provides power with skis and poles, and the dog adds additional power by running and pulling. 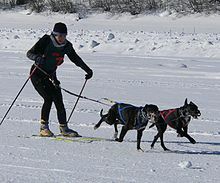 The skier wears a skijoring harness, the dog wears a sled dog harness, and the two are connected by a length of rope. There are specialist suppliers of skijor equipment to get you started. Of course, careful winter paw care is needed and some dogs may be fitted with protective footwear for the sport. There are lots of jokes that circulate at this time of year about a dog’s resolutions for the new year (e.g., kitty-box crunchies are not junk food, etc.). But what about your resolutions for your role as a Doggy Mom or Doggy Dad? 1. Resolve to feed your dog the highest quality dog food you can afford. Not sure what to feed or even if you are feeding the right amount? That’s where a nutritional assessment comes in. People like me are trained in reading the labels of your existing dog food and with some information about your dog’s condition and lifestyle, we can tell you a lot about whether you are feeding the right amount and make un-biased suggestions about your core dog food. 2. Exercise more – for your dog and yourself! Exercise is important mental and physical stimulation for both you and your dog. Discover new walks, link up with walking partners and doggy buddies for more variety, and manage your exercise according to the temperatures of the day (your dog doesn’t have the heat regulation system that you do in the summer; and their paw pads can be irritated by road salt and ice during the winter). 3. Groom your dog – regularly. If you don’t know what to do, then take your dog to a professional groomer and get advice on maintenance that you can do at home. It breaks my heart to hear about veterinary nurses and groomers that have to work on severely matted dogs because their owner has neglected their grooming responsibilities. 4. Make time for your dog. I signed off last month’s newsletter to my Canine Catering customers saying “remember that the best thing you give your dog this holiday season is your time.” It goes for the rest of the year, too. Your dog is a social animal and needs your love and attention throughout the year. 6. Have fun together – play time is essential. Dog walks are not the only stimulation for your dog. Choose an activity that suits both you your dog. It could be agility or obedience training, rally-o, fetch, cross-country skiing, hiking/tramping, or the use of interactive dog toys. I wish you and your dog a wonderful 2012. Contact me through this blog or my website for information on any topic I cover in this blog.